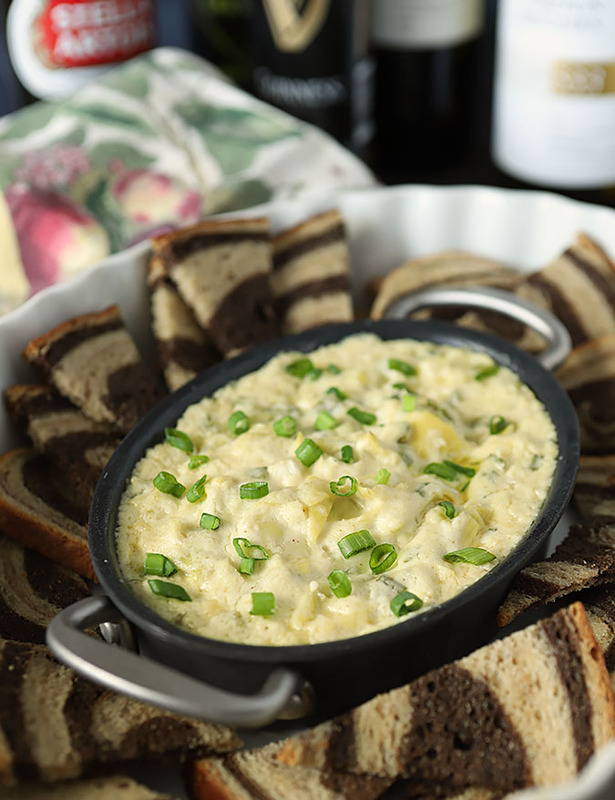 The perfect appetizer for your game day TV viewing; this Wynkoop Brewing Artichoke and Parmesan Cheese Dip is warm and savory and perfect served with some toasted rye and pumpernickel bread. Many years ago when I found myself single again after years of marriage I was at a loss for how to navigate any type of social life. I had been married for 16 years and had two young children; that was the life I knew and loved and all of a sudden everything changed. Still, I’m not a recluse so I needed to discover a social life of my own on those rare days when my children were with their father. THE place to go for us was the Wynkoop Brewery. Casual and fun, they made beer on premises and had a great variety of appetizers we enjoyed with our craft beers (they were most definitely on the cusp of that move in Colorado when they opened in 1988). At the time there were so few choices for a casual spot with good food and some great beer that it was a shining star and pretty much became our only destination. That decision was most definitely influenced by my love of their Artichoke and Parmesan Cheese Dip served with Beer Bread; it became the ‘must have’ appetizer. I loved it then and still love it today and it’s a good thing I have the recipe because it’s not on their menu anymore! How things change right? 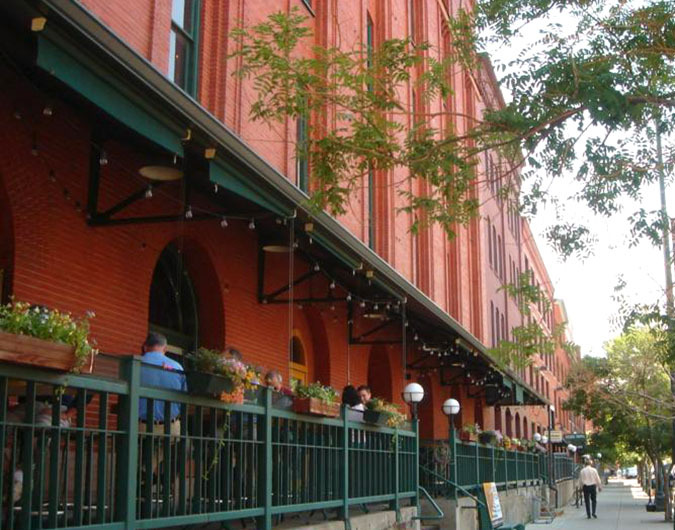 Now the Wynkoop is just one of many, many restaurants in the area called LoDo (Lower Downtown); the original owner is now the Governor of Colorado, John Hickenlooper, and the landscape of downtown changed dramatically when the Colorado Rockies baseball team came to our town in 1991. Restaurants are everywhere and everything is open later but traffic is a nightmare and parking is expensive. I moved further south a couple of years ago so all told, I’m more inclined to rustle up something in my kitchen and offer up cocktails to friends that I invite over to my home. This past week I actually made this and took it with me when I gathered with friends that I’ve met through food blogging; those get togethers are fun and I can promise you the food is always divine. 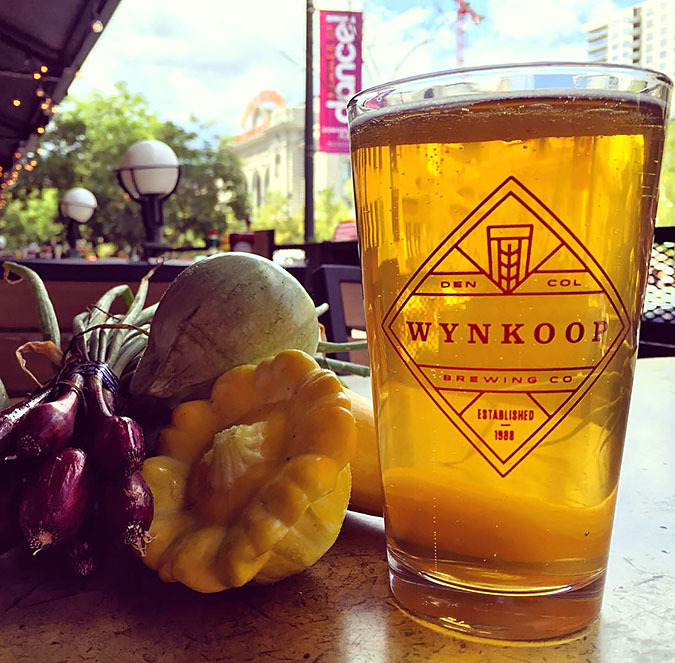 While the Wynkoop served the dip with a wonderful beer bread flavored with rye and molasses, I’ve not found the recipe for that bread yet (I did call and begged the chef to share so maybe one day?) but no matter, for this event I had no time to make bread and came up with something easier to serve with this fantastic dip. It was as simple as purchasing a loaf of Pepperidge Farm Rye & Pumpernickel Deli Swirl Bread, brushing it with some melted butter seasoned with garlic and then toasting it gently. Once out of the oven I cut it into triangles and it was perfect for my ‘at home’ experience; it would not be the same without that touch of rye flavor. This is perfect game day food. Even though my Broncos had a miserable year we would like to forget, the playoffs and the SuperBowl still require some great food and drink. This recipe makes enough for a crowd and I was able to serve it in a large ramekin with the toast in the family room with another plate for the cook setup in the kitchen. I should have made more; it was DEVOURED!! 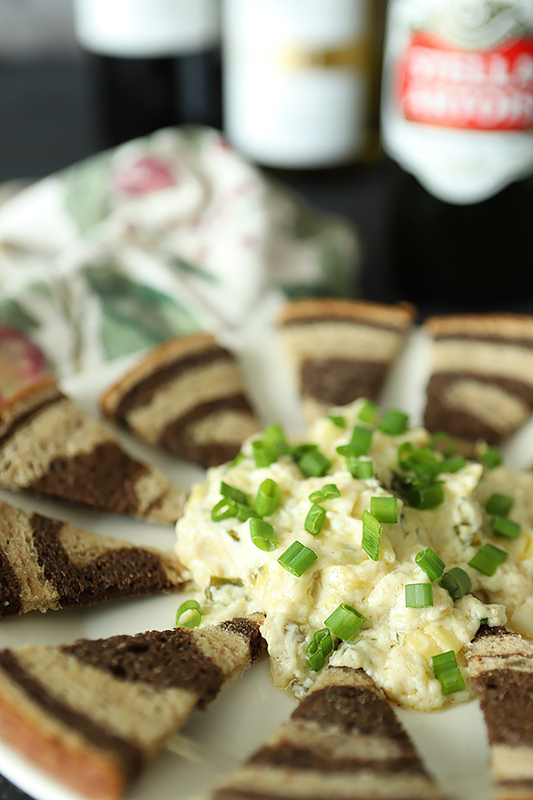 Maybe I’ll get that bread recipe and share it eventually too but don’t wait for that moment to enjoy this appetizer. All you really need is a spoon. Drain and coarsely chop artichoke hearts. Mince white and green parts of green onions. Combine mayonnaise and sour cream and whisk together until well mixed. Add chopped artichokes and green onion along with garlic, pepper, celery salt and Parmesan cheese and mix well until thoroughly combined. Place in two ramekins or ceramic serving dishes and bake for 25-30 minutes until hot and bubbly. Remove from oven and garnish with additional green onion slices. 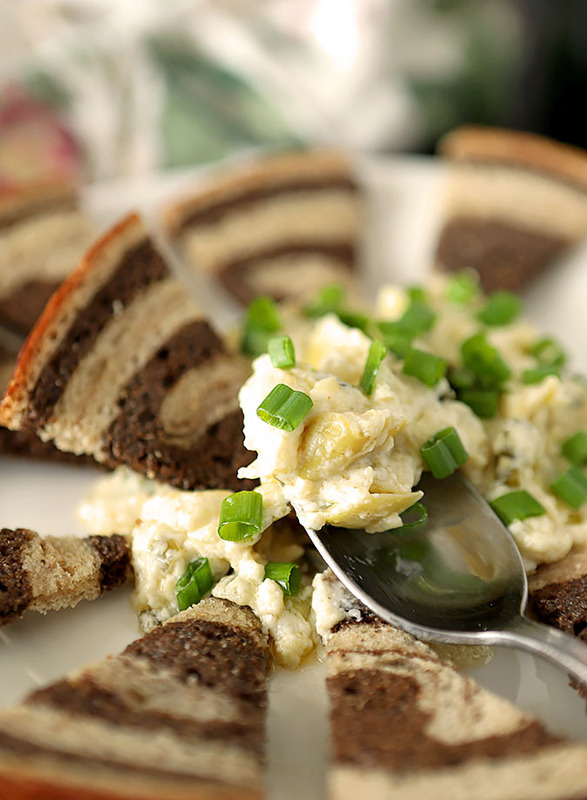 For the bread slices, brush each slice with a combination of melted butter and dried garlic (to taste). Toast at 400 degrees just until firm but not until crisp. Remove from the oven and cut slices into triangles. let cool. Keep in airtight container or storage bags if not serving immediately. Alternately simply serve with a rye cracker. You gotta work on getting that bread recipe — sounds really good. Although I’d be more than happy with this dip! Mix cheese with artichokes and you always have a great combo, don’t you? This looks really good. And I do;n’t have to travel to downtown Denver to try it! Thanks so much. I’ve put in a call and fingers crossed the chef will share it. Considering it’s not even on the menu anymore I’m hopeful! I found a recipe online and tried it…no way no how was it the same thing! Oops…did I forget that? Preheat oven to 350 degrees. I’ll go fix that NOW…thanks!